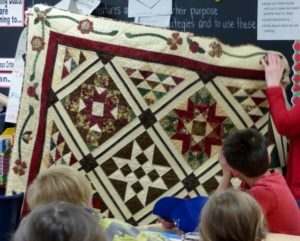 On Monday, six volunteers from the Cavan Monaghan Barn Quilt Trail Project joined Mrs. Sturgeon’s Grade 4 class to introduce them to the local project. The volunteers, many of whom are former teachers, were there to help students design their own block which might eventually be incorporated into a quilt on the trail. These students are the first group to begin the actual preparation of blocks for the quilt trail project. Volunteer Elaine Young introduced students to their task, showing them an actual fabric quilt and reading a book entitled Oma’s Quilt, which illustrates the emotional power of a quilt. They also reviewed the websites of other quilt trail projects to get an idea of how their blocks would be displayed. Students were asked to design a quilt block using images with meaning to them, their families or their community. The first step in the block creation is planning. Students were given large sheets of graph paper to plan their project, as well as books and illustrations to provide inspiration for their own unique design. Some students dove right in to their task, choosing images of video game characters, flowers, pets or geometric designs. Others were more cautious, reviewing material and sketching out the 12” square that would accommodate their design. The volunteers will return to the class next week with 12” square blocks that are sanded and primed and ready to go. Students will paint their design on their blocks one colour at a time, using tape to separate the colours. The most difficult task will come after the blocks are complete- choosing which ones will be displayed and how they will be configured in their ultimate position of prominence somewhere in our community. Tagged barn quilts, Cavan Monaghan, local events, local people. Bookmark the permalink.